The Guide, completely restyled for its tenth birthday, contains 150 pages of tourist information and excellent trips for everyone visiting the region: markets, events, swimming pools, playgrounds, panoramic viewpoints, hikes… The remaining 250 pages are dedicated to the best attractions and activities in the Ardennes and are filled with unique discounts. 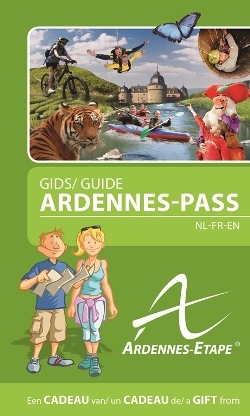 The Guide Ardennes-Pass is organised by tourist zone in the Ardennes, contains maps and a RAVeL itinerary (with six routes) as a bonus. The Guide Ardennes-Pass is offered exclusively to Ardennes-Etape holiday-makers. To avoid all misunderstanding, the Guide Ardennes-Pass is the essential partner for an excellent stay in the Belgian Ardennes. This entry was posted in Guide Ardennes-Pass, Press release and tagged ardenne, Ardennes, guide, guide ardennes-pass by Ardennes-Etape. Bookmark the permalink.